On December 17, 1953, a newly crowned Queen Elizabeth II and her husband Prince Philip, Duke of Edinburgh, arrived on the island of Fiji, then an English colony, and stayed for three days before continuing on their first tour of the commonwealth nations of England in the Pacific Islands. What is the Commonwealth of Nations? The Commonwealth of Nations, today commonly known as the Commonwealth, but formerly the British Commonwealth, is an intergovernmental organization of 53 member states that were mostly territories of the former British Empire. While the precise date of the photograph depicted above is unknown, there is still much that can be learned both about Fijian art and culture and the Queen’s historic visit. 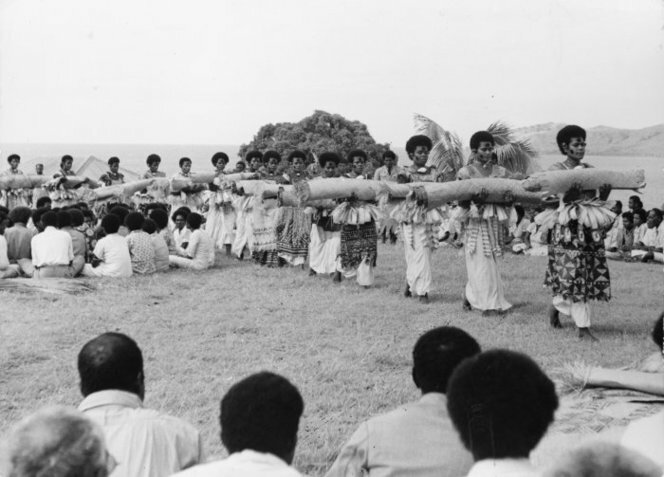 The first thing you might notice in the photograph is the procession of Fijian women making their way through a group of seated Fijian men and women. Several of the processing women are wearing skirts made of barkcloth painted with geometric patterns. Barkcloth, or masi, as it is referred to in Fiji, is made by stripping the inner bark of mulberry trees, soaking the bark, then beating it into strips of cloth that are glued together, often by a paste made of arrowroot. Bold and intricate geometric patterns in red, white, and black are often painted onto the masi. 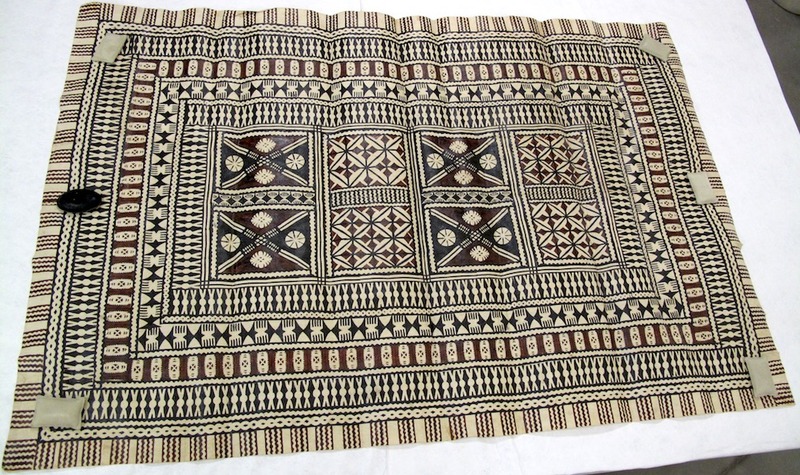 The practice of making masi continues in Fiji, where the cloth is often presented as gifts in important ceremonies such as weddings and funerals, or to commemorate significant events, such as a visit by the Queen of England. While in this photograph, the masi is only worn by the women and not carried, as far as can be ascertained in this picture; it is very likely that the women also presented the cloth to the Queen to celebrate the occasion of her visit. What is definitely evident from the photograph are the rolls of woven mats that each woman in the procession carries. Like masi, Fijian mats served and continue to serve an important purpose in Fijian society as a type of ritual exchange and tribute. Made by women, Fijian mats are begun by stripping, boiling, drying, blackening, and then softening leaves from the Pandanus plant. The dried leaves are then woven into tight, often diagonal patterns that culminate in frayed or fringed edges. While the mats that the women in this photograph are carrying may seem too plain to present to the Queen of England, their simplicity is an indication of their importance. In Fiji, the more simple the design, the more meaningful its function. Fijian artists continue to create mats and it is a practice that is growing, with many mats beings sold at market, often to tourists. With the advent of processed pandanus, they are more widely available than masi, and used heavily in wedding and funeral rituals. 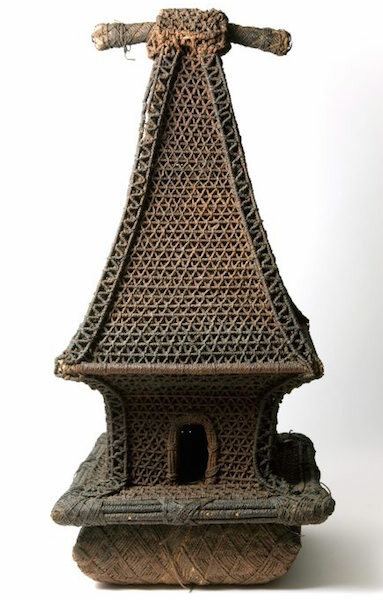 In addition to masi and mats, Fijian art also includes elaborately carvings made of wood or ivory, as well as small woven god houses called bure kalou (left), which provided a pathway for the god to descend to the priest. Returning to the Queen’s visit in 1953, while in Fiji she visited hospitals and schools and held meetings with various Fijian politicians. She witnessed elaborate performances of traditional Fijian dances and songs and even participated in a kava ceremony, which was (and continues to be) an important aspect of Fijian culture. The kava drink is a kind of tea made from the kava root and is sipped by members of the community, in order of importance. On the occasion of the Queen’s visit, she was, as you might imagine, given the first sip of kava. In thinking about the importance of the kava ceremony, consider what might happen if everyone from a large group takes a sip from the same cup and of the same liquid. Although sipped in order of hierarchical importance, it would, in the end, put everyone in the group on the same level before beginning the event, meeting, or ceremony. After three days on the island of Fiji, Queen Elizabeth II and Prince Philip departed for the Kingdom of Tonga where they stayed for two days before leaving for extended stays in New Zealand and Australia. On Tonga, they were greeted warmly by Queen Sälote and other members of the royal Tongan family. On the occasion of her visit to Tonga, an enormous barkcloth was commissioned in Queen Elizabeth’s honor and had her initials, “ERIII,” painted onto the rare piece of ngatu. Referred to as ngatu launima in Tongan, it is just shy of 75 feet in length and is significant not only because it commemorated Queen Elizabeth’s visit, but also because it was placed under the coffin of Queen Sälote when her body was flown back to Tonga in 1960 after an extended stay in a New Zealand hospital. The barkcloth is now in the collection of Te Papa Tongarewa/Museum of New Zealand, after being donated by the pilot who had flown Queen Sälote’s body back to Tonga, to whom the barkcloth had been given by the Tongan Royal Family. Rod Ewins, Mat-Weaving in Gau, Fiji (Fiji Museum Special Publication, 1982). ———- Staying Fijian: Vatulele Island Barkcloth and Social Identity (Adelaide: Crawford House Publishing, 2006). ———- Traditional Fijian Artifacts (Nubeena, Tasmania: Just Pacific, 2014). J.W. Sykes, The Royal Visit to the Colony of Fiji of Her Majesty Queen Elizabeth II and His Royal Highness The Duke of Edinburgh (December 1953). Cite this page as: Dr. Jennifer Wagelie, "Presentation of Fijian Mats and Tapa Cloths to Queen Elizabeth II," in Smarthistory, November 23, 2015, accessed April 21, 2019, https://smarthistory.org/presentation-of-fijian-mats-and-tapa-cloths-to-queen-elizabeth-ii/.